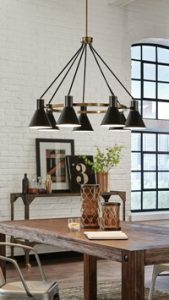 One of the most current trends in lighting design is the blending of metals. A mix of metal and glass or two different metals can give a classic space a contemporary twist. You can achieve a cool, glamorous look from seemingly heavy, impersonal materials, by thinking of metal as you would any decorative material. 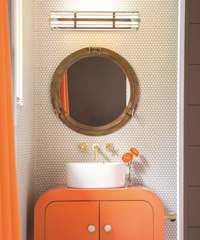 Consider a black or steel gray metal shade; a fixture that combines metals of differing weights and colors; or a wire-mesh shade that allows light to filter through tiny constellations of metal dots, squares or other distinctive patterns. This new approach to unique fixtures and shades gives you an almost unlimited avenue to be as traditional or out-there as you like without sacrificing style or charm. 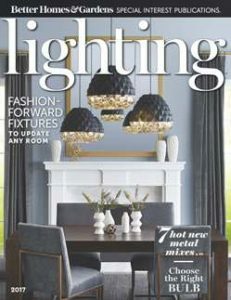 To learn more about mixed-metals lighting as well as other lighting trends, pick up a copy of Lighting magazine at an Hortons Home Lighting. There you will find professionally trained experts to show you all the latest lighting technology and trends. The 2017 issue of Lighting magazine is the best go-to resource for home lighting and design inspiration. The magazine features the latest styles and technology for creating a home that is beautiful, efficient and smart. Also included are many photos and design tips. For example, the color of your light fixture is just one of the considerations to make in the overal composition of your room. If you lean neutral in your décor, use a richer material — a deeply painted metal or wood — so your chandelier works as a grounding element. Or, in a more brightly hued space, pick one of the secondary colors, and use it to guide your color choice of drum shades for mini pendants. What is the best LED lighting for a 6×8-ft. bathroom? The only light will be above the mirror over the vanity. -Sara K.
You could choose a fixture with standard medium-base sockets and install LED bulbs that fit the sockets. You would need LED bulbs equivalent to the standard 60-watt incandescent bulbs with approximately 800 lumens each. Considering there is only one fixture in your bathroom, you could go to a higher lumen output, and perhaps go to a 75-watt equivalent and use a dimmer, which would allow you to lower or increase the light level as needed. You could use an integrated LED fixture, which does not have light bulbs but instead is integrated with the LED lighting as a permanent part of the fixture. LEDs have extremely long life (about 50 times that of incandescent) making this essentially a lifetime fixture purchase. With this option you would want a fixture in the range of 1200-2000 lumens. Integrated LED fixtures are more efficient in delivering light, making it possible to go with a slightly lower lumen output (1200 lumens).